Where Do Famous People Get Buried? Home » Useful links and resources » Where Do Famous People Get Buried? They take up so many column inches and cover so many front pages during their lifetime, it’s little surprise that famous people are even grabbing the headlines once they have died. Whether they’re from the world of sport, music, film or politics, the final resting places of celebrities become pilgrimages and points of interests for their fans all over the world. 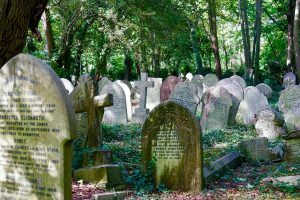 If you’re curious as to where the rich and famous choose to lay their head for the last time, here’s a quick rundown of three of the more popular celebrity graveyards around the globe. As the capital of all things TV and film, it’s only logical that Hollywood is the favoured final resting place of many an A-lister. Famous names like Mel Blanc and Cecil B DeMille are to be found among the multitude of tombstones, while perhaps the most famous grave in the entire cemetery is the cooler-than-cool bust of Ramones guitarist Johnny Ramone (bassist Dee Dee is also buried nearby). The graveyard is so big it’s navigable by car and hosts cinematic late-night screenings of films made by those interred there, as well as a hugely popular Day of the Dead celebration every October. With over three-and-a-half million visitors each year, this Parisian cemetery is the most well-attended in the world. It’s not hard to see why, either; not only is it a beautifully tranquil oasis on the eastern edge of the city, it’s also home to a huge list of household names. 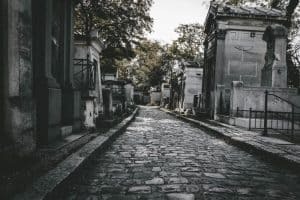 Among others, you’ll find the graves of writers Oscar Wilde, Marcel Proust, Honoré de Balzac and Molière, composer Frédéric Chopin, singers Edith Piaf and Jim Morrison and dancer Isadora Duncan, as well as a very impressive series of memorials to Holocaust victims. It’s hard to say whether Highgate on the outskirts of London is more famous than Westminster Abbey in its centre, especially as the latter is home to a multitude of kings and queens and has a section dedicated to legends of literature, known as Poets’ Corner. However, the imposing bust of Karl Marx in Highgate makes it perhaps an even more recognisable landmark, and other famous names from all walks of life are buried here too. The comedian Max Wall, artist Lucian Freud, writers George Eliot (aka Mary Ann Evans) and Stella Gibbons and actor Bob Hoskins are all to be found on the northern fringes of the city. While you might not have the finances or the inclination to be buried alongside these famous luminaries, it does make sense to consider where you would like to end up. Making these decisions now can relieve the strain and stress on your bereaved friends and family at a time when they’re already under intense pressure, and indeed creating a funeral plan now can even save money by locking in the arrangements at today’s prices whatever happens tomorrow. To find out more, give us a call 01983 754 387 and we’ll be happy to help.